After two successive stronger results for Labor, Essential Research is back on Team 53-47. The Guardian reports the Coalition has recovered a point in the latest fortnight rolling average from Essential Research, which returns to 53-47 in favour of Labor after two weeks at 54-46. After accounting for an apparent transpositional error in the report, I believe the primary votes are Coalition 38% (up two), Labor 37% (down one), Greens 10% (steady), One Nation 7% (steady) and Nick Xenophon Team 4% (up one). The poll also finds that 56% approve of the new national security ministry, with 18% disapproving; 45% expect it will strengthen national security, 28% think it will make little difference and 8% think it will weaken it; and 45% registering concern that Peter Dutton will have control over all security services, with 35% not concerned. The report provides an incomplete account of questions on an emissions intensity scheme taxing pollution above a certain level (54% are in favour) and the National Broadband Network (48% of the 40% who have it say it beats their previous service, but only 19% say it is much better, and 51% say it’s about the same or worse). Full results should be with us later today. In other news, if you’re a Crikey subscriber you’ll find that I’ve had a lot to say about the Greens recently, in a report on the succession to Scott Ludlam’s Western Australian seat that may be showing its age; an account of the deficiencies of Section 44 (see also Laurie Oakes); and a look askance at conservative suggestions that the party is, uh, “cooked”. UPDATE: Full report here. We also have bonus Newspoll questions on Tony Abbott, which find 58% favouring Malcolm Turnbull on “best values and leadership credentials” against 23% for Abbott, and pose a question on his future in politics that unusually doesn’t feature an option for him to leave it. NOTE ON NEW COMMENTS ARCHITECTURE: Regular visitors will shortly notice that the design of the comments section has been overhauled. This has mostly been done for site performance reasons, to which it has made an immediate and massive difference. As you can see, there are lots of new features that people have long asked for. If we can get used to reverse chronological comments, I think it will prove to be a great outcome. A tip for acclimatising yourself here: you do not need to refresh the page to see new comments, and you will cause yourself an annoyance if you try. You will see, at the top of the comments thread, a green “x new comments” button when new comments appear – all you need to do is press this and they will slot into view. Also, for emoji that work, see here. One way or another though, this is how it will be for the next few days, after which the situation may be reviewed. When I hit refresh, the first comment, with yellowish background, is from cud at 10.48 about time stamps. Edit: then subsequent posts are most recent. 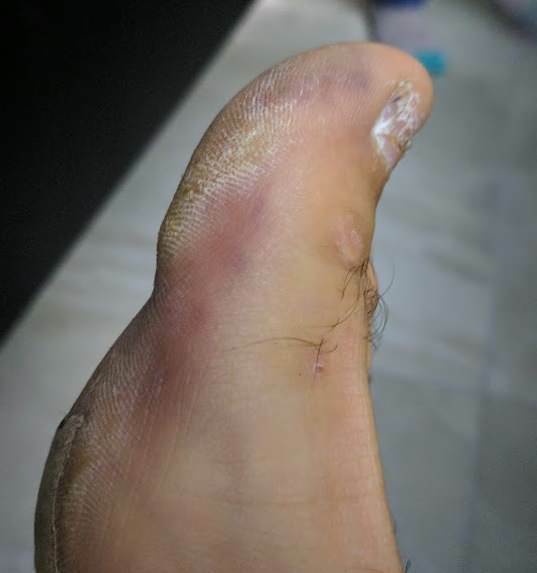 Seeing how pictures work now, would anyone (particularly the small handful of people on here with actual medical backgrounds) care to idly speculate about what’s wrong with my foot? I’m getting recurring (basically weekly, at this point) “bruising” on that toe, usually (but not always) during exercise/exertion. It’s not really a bruise, as none of the purple area is actually sore/tender. What happens is I’ll get a sudden, sharp pain below the toe, at the joint where it meets the ball of the foot. The pain usually fades within 10-15 minutes or so (though has been lingering a bit longer lately), and there’s no loss of movement/flexibility. And it’s always accompanied by a feeling like I’ve got a small pebble lodged underneath the toe (even though there is no such pebble, and even if I’m barefoot at the time). A day later and the area around (and beneath) the toe is purple. A few more days and the color is back to normal. Doctor has looked at it, doesn’t know what it is. X-ray pending. Nevermind the weird-looking toenail, that’s an unrelated injury (stubbed it under the corner of a door). And the tape (bottom left) is for plantar fasciitis, also unrelated. That foot has many problems. When the format changed I thought it best to disable Greasemonkey. Crikey is wrong when they suggest Canavan actually acquired Italian citizenship because of his mother. It’s all a bit funny to watch the pollies scramble to not be dual citizens. A second citizenship of EU country is a very desirable thing to have so you can live and work in the EU. Since a constitutional change is so difficult to achieve, surely the legislation defining Australian citizenship could be amended by Parliament to provide a simple mechanism to renounce any foreign citizenships? Any lawyers here care to comment? The irony with Waters and Ludlam is that the countries they are dual citizens of have the same head of state as we do, so the question of allegiance is somewhat moot IMO. MyRepublic released research carried out by Galaxy in the wake of the launch of what it says is the first Australian Gigatown in Wollongong and to “prove Australians want — and need — affordable ultra-fast Gig speeds”. According to Nicholas Demos, managing director at MyRepublic Australia, the research also sends a clear message to the nation’s ISP’s and government: Australians are dissatisfied with their slow home internet speeds, they want 1Gbps speeds or more, they are worried about losing the digital economy race, and believe “we are getting a raw deal compared to our Kiwi cousins”. Demos claims the research findings support MyRepublic’s Gigatown and “prove Australians hunger for reasonably priced access to higher speed, premium fibre products”. “When we asked Australia to tell us why their town should become the first Gigatown, the overwhelming theme was the need for affordable ultra-fast speeds of up to 1Gbps. “We know that people don’t need 1Gbps all the time, but when someone wants to stream the latest 4K movie, someone wants to download the latest version of IOS for their mobile, someone else wants to download the latest game for their PlayStation, it all just works and that’s what Gig speeds provide. Demos says MyRepublic believes that the 1Gbps plan is a premium product and have positioned it at the $129.99 price point “as we believe that is fair”. Well that was interesting. I tried the htm tags for bold and all they did was completely remove the enclosed text. @ Ctar1 – that is not the story that we have been told. The story we have been told is that an application was made for Canavan’s citizenship, and that this application was approved, granting Canavan citizenship status, not merely the ability to apply later if he so wants. Canavan’s mum is about to go to jail for forging her son’s signature on his citizenship application. Some Italian bureaucrat (who has likely since retired) will be fired for approving a citizenship application without a signature. The Italian citizenship application process is lax, not requiring a signature. In any of those 3 cases, was still a citizen at the time he ran for the Senate. If his citizenship were revoked by the Italian government, then he could run in next year’s election. But at the time the constitution is concerned with, he was a dual citizen, even if only due to admin error. I see the Crikey pixies have restored the wordpress absolute timestamp. I would suggest also re-enabling pagination. (obviously use a number bigger than 5). Ticking the box at the start will override the WPDISCUZ ‘Load More’ or Infinite scroll features. This would make it much easier for people to go back in time to a point they were previously reading from. Also Enabling ‘quick tags’ will show some simple html markup options, which might be quite handy for people to build their blockquotes, open & close tags work quite nicely actually. Will continue to play around a bit in my sandbox to see what else may help. ARGH. That looks really painful. I hope someone can help. How do you know he “didn’t apply”? It’s quite possible he’s lying, and did know, specially since he was well and truly over the age of 18 when he gained dual-citizenship. Waters on a mission to “clean up” and stand again asap it looks like. Unfortunately I have since turned my back on using pagination, with new posts showing at the top of whatever page you’re on, even if this is some ways back, it makes it pretty messy. Thanks. Now have time stamp. Seriously, this is bleeding crap. I make a post and can only see my posts plus a few others. Refresh, same same. Refresh again, half an hour later, and lo and behold up pop other posts, in between, that are pertinent to the discussion, but hidden for a certain amount of time. What’s with system? Or is just my browser? Or IPS? IOW, WTF is going on????? As you state that the ‘bruising’ mark appears after exercise, might I suggest that you get yourself fitted with a good pair of shoes for same. Something you are doing is causing a pressure problem in that place….it seems to me. However, may I also suggest that there may be some relevance wrt your circulation. A bluish tinge may be suggestive of lack of oxygenation of the capillary blood closest to the skin surface. Though if you have just been exercising that would normally suggest that your blood was well-perfused as a result. Are your feet cold or hot afterwards? Sweaty? Thinking about your other comments I, as a recent sufferer of Plantar Fasciitis, can pretty much say for sure that the pebbly feeling is related to that. I had to have 2 injections of corticosteroids into my foot to resolve that pain and I suggest you go see your doctor about doing the same. It worked really well. My doctor also suggested getting a foot insert to put into my shoes, or even a personalised Orthotic shoe insert. You know, that ‘bruising’ could also be related to the imbalances in your foot, pronation etc. But I could be wrong and Diogenes or RhWombat would be better medical authorities than I, a lowly Pharmacist. Yeah, I’m not too sure why but the live updates seem to be disabled. Thanks for that, I do recall some discussion on html recently. Do you have a list of valid tags? Also, I note your quoting of me shows a post number date etc. What add-ins are you using? I was wondering why I started getting more calluses on my feet and it occurred to me that a while back I had switched from swimming to walking as my main exercise. It could be something that builds up over time and you don’t think of. Like if you drive a lot and have changed cars it might be the way your feet use the new pedals. I thought it was about time to discuss something other than the blog issues! Interesting story and really pulls the rug out from under Turnbull’s crap. Re Canavan; surely at his age when his mom applied for citizenship, he was notified by the Italian consulate or some such that he had been successful? Zeh, re shoes. New Balance have up to 6E. Seriously excellent, and very long lived. 574 and 624 strongly recommended. 574 fine for busines wear. Zeh, I meant New Balance 813 for business wear. I have a pair of size 8 width 4E on that I have worn virtually every day for over 3 years, and I average over 10,000 steps a day. Convicted fraudster and father of “Senator” Matt, Bryan Canavan has found “gainful employment” at, where else, a Queensland home builder. His mother would have been notified that her application for Italian citizenship was successful and therefore her children were now also eligible to apply for Italian citizenship. Labor can be glad they have the resources to undertake a thorough candidate vetting process. Ahead of the 2010 election, the Labor Party discovered during a vetting process that its Tasmanian-born candidate Lisa Singh held British citizenship. …….she had been given automatic British citizenship as a “birthright”. “I was lucky the Labor Party did the work because, despite being born in Australia, I was shocked to find out that I was also a British citizen, through my father,” Singh told BuzzFeed News. …..Singh sent BuzzFeed News a copy of a letter from the British High Commission in Canberra which confirms the Labor MP successfully renounced her previously unknown British citizenship three days before the election. Why would anyone be confused about their citizenship? Again, it’s not a matter of knowing Australia’s laws around this, it’s a matter of knowing the laws of the other countries. One Nation senator Malcolm Roberts is under mounting pressure to prove he’s eligible to stay in Parliament but is refusing to provide evidence he renounced his British citizenship before last year’s election. A potentially landmark ruling on Canavan’s case raises major political and legal problems and underlines the case for a full audit of all 226 representatives. Yet neither side of politics embraces that probe for fear of what could be unearthed. This is a can of worms big enough to end more careers and even force a general election. Did Pegasus scare everyone off? My disgusting foot scared everyone off. That, or you missed WB’s post @2:36pm about how there’s a new thread. Thanks for alerting me. Yes, I did miss it, I often don’t drop by for periods of an hour or so. The Drum. With David Maher and Jackie Kelly … Total waste of time and electricity. Malcolm’s Roberts keeps demanding empirical evidence re climate change. Well Malcolm let’s have the hard evidence that you have given up your British citizenship. You claim to have the proof. Well release it! Crikey pointed out that this story was about Canavan’s father. Nice bloke, those good honest country folk. I wonder how pleased the Italians are to have him as a citizen?